While the North Marion boys soccer team may have fallen short of its ultimate goal of bringing a second state championship trophy to the high school, the Huskies finished the 2018 season by continuing to build on a legacy of success that began before this year's graduating class was even in middle school. Over the past decade, North Marion has quietly put together one of the most consistently good boys soccer programs in the state at the 4A level. The team has made 11 consecutive post season appearances, building an 18-10 record that includes one state title, two championship appearances, three trips to the semifinals and six quarterfinal games. This year's team was the first to feature a senior class that was not a part of the team's 2014 title, and the Huskies sought to carve out their own place in North Marion history while playing in the shadow of that legacy. "We had to make our own legacy," North Marion head coach Rafael Pelaez said. "We had to build something for the program." The Huskies knew coming into the season they had all the building blocks for a great team, but after starting the season with one win in their first six games, including back-to-back draws to open their league schedule, the team knew it had an uphill battle to face. "At the beginning after we tied the first three games in our league we felt like it was going to be tough," Pelaez said. "After that we started winning. At practice we start talking about having to play together, we can't play as individuals." The team's captains — seniors Edgar Lopez and Andres Agabo, and junior Rene Ramos — took that to heart. North Marion had all the talent necessary for a deep playoff run, but the team needed to work as a sum of its parts and not as 11 separate players on the field. "They started talking a lot," Pelaez said. "Andres and Rene said it's going to be hard, and we can do it. Whoever we face, we'll do our best." A 12-0 victory over Estacada got the ball rolling, and soon the Huskies had rolled off a string of three consecutive shutouts to take the lead in the Tri-Valley Conference race. A 1-0 loss to Gladstone on senior night knocked North Marion out of contention for a league title, but it further galvanized the Huskies to work together as a team and use their emotion to the advantage. "It's not only skill with this team, it has to be with our heart," Pelaez said. "We have to use our feelings, we have to go with all we have, all our heart. Every game they say that and it works." From there, North Marion played the rest of the season on the road. A final game at Corbett secured the team a trip to the first round of the playoffs, where they traveled to Eastern Oregon University and knocked off the No. 4 La Grande Tigers by a 2-1 score. That's when the team really understood that they could do something special. "After the La Grande game is where we said it's going to be hard, but we can make it to the other side of the line," Pelaez said. Another road game, another victory, this time 1-0 over the Seaside Seagulls, setting up the team's incredible 1-0 semifinal win over the previously unbeaten No. 1 Phoenix Pirates. 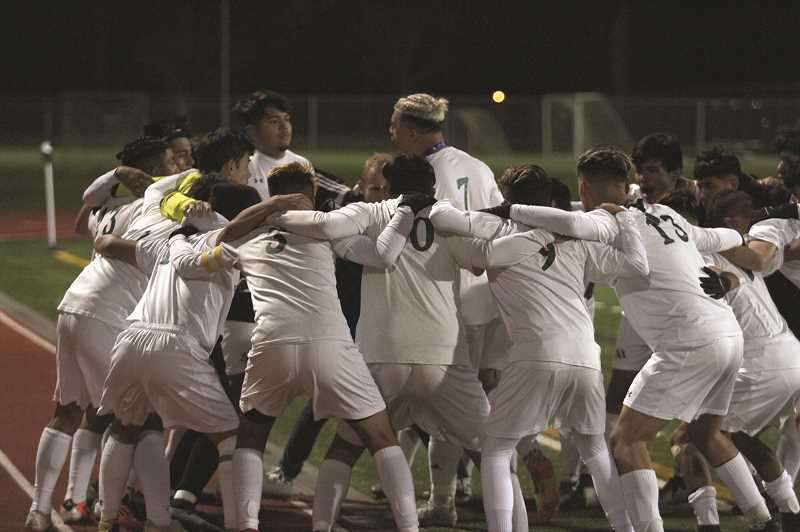 While North Marion went on to lose to the Woodburn Bulldogs in the state championship game, it built a playoff run that rivals any that the boys soccer program has done in school history and continued the tradition of excellence for the boys soccer program.